These are some example exam questions that have been kindly submitted by trainees. Please let me know if you have some questions, this could become an invaluable resource. pathology outlines now have an excellent set of board review questions which I think will also prepare UK STs well for the part 1 and final exam. Here is an example of the thyroid questions; just click on the answer to reveal. "If you are as bad at cytology as me then then cramming courses in cytology (I did Bristol and Northwick Park ) are essential with one close to the exam date. I did both Hammersmith Courses but not immediately before the exam (bit too much overload I think), I've heard the Oxford courses are also good and I did all the Brighton Courses (now Newcastle) when I could as a junior SpR. Placements in Soft tissue (3/52), Liver (2-3/52) and Renal (4/52) depts is also very useful in the run up to the exams and as they are quite quiet allows for lots of reading around other subjects at the same time. I should have done more lymphoma stuff but you can't do everything. I've never done any Medilink courses but some of them are a bit too simple for Part 2 stuff. The best way to pass parts 2 remains pushing glass (not reading Ackerman cover to cover) and reading around each case with a small battery of nice books (WHO series esp soft tissue and lymphoma, Fletcher for DD's, Rapini - skin.... and don't forget the basics of physiology - Robbins and the post mortem stuff (I took 'Dealing with Death by Green' on my honeymoon which may not be the best solution)). This seems like a lot of stuff to do but be systematic and it passes OK. Good luck, see you in August I hope"
"I went on the Newcastle and Oxford courses. Newcastle is good but ...... it doesn't cover everything. Oxford is amazing and I would thoroughly recommend it - it is a lot of time (2 weeks) and seems expensive but I think is well worth the money. I think it is worth going on the Oxford course just before your exam as it consolidates all your revision & gives good tips on exam technique. I also went on a cytology course at the East Pennine Cytology School in Leeds which was brilliant too. It was in July, not sure if they run it twice a year or not. It covered gynae & non-gynae and is a bit more geared towards Surepath for the gynae but still very well worth it (despite the travelling). I didn't bother with an autopsy course but have heard that some were very good. "the 2 week Oxford course is excellent but gets very booked up. I did it 18months before I sat the exam and found it really helpful. Didnt think much of the nigel kirkham course which I did 4m before the exam I think that would be better as a more junior SpR"
"I only went to Oxford MRCPath course. It was a good course. In my opinion it is best to do this course closer to the exam when you are well on your way into revision for the exam (almost 80-90% done). It serves as a good revision and you will be able to see many cases. The time you will get for each case is very limited and hence its good for revision rather than learning. The only drawback is probably no suficient time for liver and kidney biopsy cases. The mock exam was good and you get the evaluation as well as feedback. There were frozen section cases too. I have heard if you are planning to learn on the course then probably Sheffield might be good but its all hearsay. You get a good deal of time to spend with the slides. The Newcastle course is reasonable but it does not cover everything in one course. You will have to do this yearly course I think 2- 3 times before all the topics get covered. Not all the sections of the course are exam related." "I went on the Oxford course last year and it was excellent. Cannot recommend it highly enough. Hundreds of slides to look at over two weeks. Covers every part of the exam. Excellent slide sets. Excellent teachers. Mock exams. And excellent social side! I also went on the week-long non-gynae cytology course in Birmingham which was also very good. Mixed quality and relevance to the exam but an excellent mock exam and some very good slide sets." After the sucess of our FRCPath Part 2 Revision Course held in February 2009 (London),we are now holding FRCPath Part 1 and Part 2 courses. For the FRCPath part 2 course we will be showing a completely new set of cases for the Autopsy and Main examination. In addition, we have Ray MacMahon and Thomas Giles as speakers. "I attended the one day (Medilink) autopsy course just before the exam and it was very good.."
"- don't spend your time revising by looking at every entity ever described on H&E but concentrate on what you are weakest on; renals, lymphomas, cyto etc. - take some water and chocolate with you (like the part 1)"
1) Know everything about everything. 2) Don't write or say anything stupid. Back in the real world, I look forwards to what you produce, but am unable to offer sensible suggestions. It seems good people fail if they have an off day. 1. Agreed - dont need to know all about all. 2. Some cases are meant to be impossible on a single H&E - try to keep calm. 3. Some cases are meant to be straightforward on and H&E - give diagnosis and move on. 4. Some cases fall somewhere between 2 and 3. 5. Unfortunately, not always easy to know whether examiner will expect a case to be 2, 3, or 4. 8. If you give an immuno panel it should be focused to answer your question, but perhaps include some that will catch you if your DD was wrong. 10. Try not to feel too dispondant if you fail - the surgical paper has a 50% fail rate (at least!). (That said, I have felt gutted since May). 1. Be prepared for a long day! 2. You need to look like you have done an autopsy before. 6. Know your coronial law and the HTA forwards, backwards and sideways - a lot of the viva is based on this! 7. Mesothelioma seems to crop up a lot. Know your meso immunos and ranges for fibre counts etc. 8. You dont have to know everything about everything. I happily pointed to the subfalcine cortex in mine and called it the tectum. Fortunately right bit of brain for what we were talking about, just wrong name. 10. 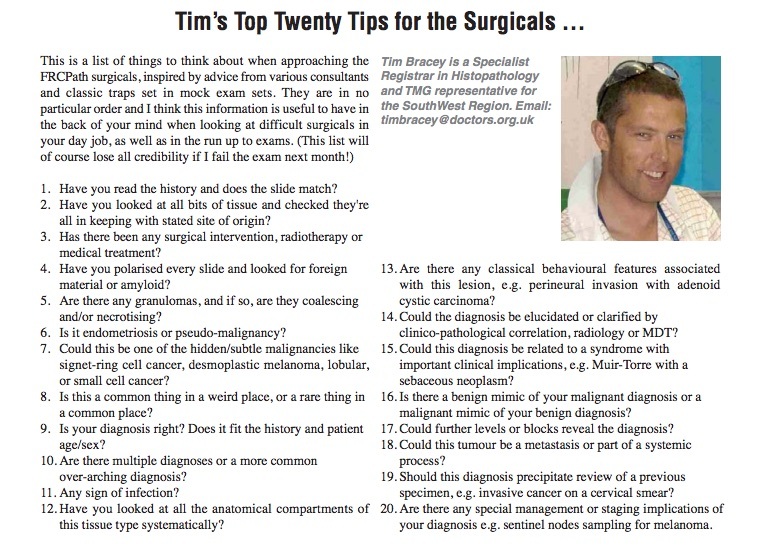 Know your basic pathology - dont get caught by simple questions such as "So - what IS an embolus?"! 12. Stick to your usual technique. The exam isnt the place to practice new ways of doing it. Sadly, unlike undergrad exams, they are out to fail you. Or at least, theyre eager to see if they can make you fail yourself. OK - here are some common guffs that I see trainees make regularly and which should be avoided in the MRCPath exam! Generally not a problem. If you're in for the exam you ought to be able to do the dissection, but remember that what distinguishes the pathologist from the technician is an ability to interpret the findings. Aim to eviscerate in 10-15 mins MAX (that should allow time to test for pneumothoraces, collect blood and urine for tox, incise the intercostal muscles and remove the testes/slice the breasts. Dont forget to do the latter. Breast cancer is common and you will look silly if you dont look for it. Dont forget to strip the dura and remove the pituitary! Make sure you can at least describe how you would take a vertebral strip, examine the spinal cord, examine the deep calf veins, etc. 2. Know your basic anatomy and anatomical terms. Do you know the difference between proximal and distal? Metacarpal and metatarsal? Dont make silly nomenclature errors. 3. Know your basic (i.e. undergraduate/part 1) pathology. Do you know what an embolus is? Thrombus? Which tumours commonly spread to bone? The types of atheromatous plaque etc? You will look dumb if you say the COD was PE and then can't say what this means. 4. Be certain when you can be. OK - what else could it be then? OK - what causes the colour change? Better to say "There is early putrefactive decomposition of the anterior abdominal wall"
5. Be precise in your measurements. You have access to a ruler, scales and a measuring jug, so dont say "approximately 400ml of fluid" etc. 6. Formulate the cause of death carefully. I'm amazed how often people prefer to state chronic conditions over the acute finding as the cause of death. Remember, the chronic condition has been around for years without killing them. That subarachnoid haemorrhage happened on the day of death and therefore is what probably did for the deceased. Part 2 of the COD is NOT a dustbin for every serious disease that you have found. For example, one of my recent cases - deceased had emphysema, hypertensive heart disease, ischaemic heart disease, hypertensive renal disease, rectal carcinoma (no mets), subarachnoid haemorrhage and ruptured Berry aneurysm. COD is: 1a. Subarchnoid H, 1b. Ruptured BA, 1c. Hypertension. The rectal carcinoma, COPD and ischaemic heart disease might have contributed to or caused death on another day but they didnt. 7. Dont fiddle with the organs when demonstrating. You shouldnt need to touch anything with your hands while demonstrating. If you have laid things out well, all you need is one or two pairs of forceps. 8. Dried out organs dont look good. Ask for a few cloth towels, dampen them with water and lay them over your dissection as you proceed through the autopsy, and it will look nice and fresh (and absorb any excess blood). Small pieces of tissue (coronary artery slices, pituitary, parathyroids, adrenal gland slices) may stick to the towel and be lost, and you can avoid this by placing them into bottle caps or tissue cassettes. 9. Know you coronial law and the HTA. Forwards, backwards and sideways. You will need to know the relevant coronial legislation by section - i.e. Tell me what section 19 says. Keep sharps to a minimum. Dont resheath needles. Dont pass sharps hand to hand. Dont walk about with sharps in your hand (use a tray). Keep your sharps in plain view. 11. Read the available history carefully. It should help you form a plan. Do you need to take microbiology specimens? Toxicology? Is it going to be necessary to look at the vertebral marrow (tumours of bronchus, breast, kidney, thyroid, prostate) etc. You only get ONE chance to take microbiology so dont screw it up. e.g. spindle cell lesion in skin, spindle cell lesion in uterus, spindle cell lesion in bowel etc. so that when I was faced with something that I didn't have a clue what it was I could at least use an approach so i wasn't giving an answer that included an immuno pannel that would bankrupt the department. I was also cunning by NOT saing i would do x, y, and z immuno on each and every case but saying "if immuno for x was performed this would highlight...etc"
Beware some cases are there to trap you! one case I had was a bone marrow trephine stuffed full of ghastly looking cells. I thought it was some horrible lymphoma/undifferentiated carcinoma but in the viva I found out it was a megaloblastic anaemia. however the examiners did comment (as my hands went up to my face and I wanted to cry) that the approach I had done would have got me the correct answer in the end. make sure you have surgical sieve for the autopsy and viva, so when you are asked the causes of pituitary haemorrhage (a genuine question!!) you can use the sieve to say at least something! As for the autopsy, I just practised, practised, practised evisceration and dissection. i went to the butchers for some cow and sheep hearts and lungs to play with at home, much to my partner's dismay!